Facilities: Infinity swimming pool (approx 10,5 x 4,5 meters, 1.6 mt deep), outdoor shower/changing area, outdoor grill, Wi-FI Internet access, fax, phone, intercom system to communicate between floors and with the pool area, piped in stereo system, TV (in upstairs living room), dishwashers in both kitchens, and a utility room with washing machine and sink. Cupola is located in Praiano, on the Amalfi Coast. 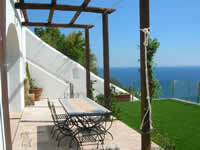 It is approximately 7 km (4.5 ml) south of Positano and 10 km (6 ml) north of Amalfi. It offers the perfect balance for a wonderful, relaxing vacation. 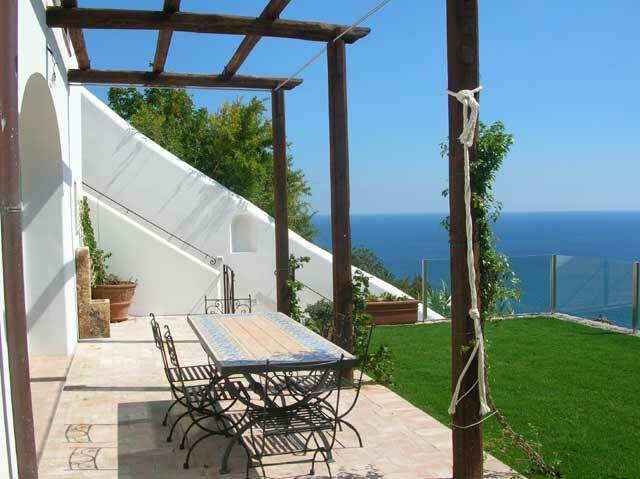 One can enjoy the peace of a Mediterranean-style small town villa while being within reach of two of the most beautiful and exciting seaside destinations in Italy, with shops, sites, cultural events and restaurants. La cupola enjoys a 180 degree view of the Mediterranean, with the Island of Capri and its world famous faraglioni on the horizon and the magical town of Positano to the right. 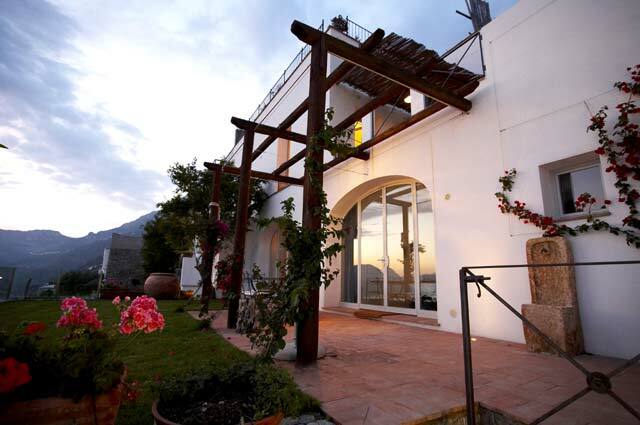 La cupola was a 16th century olive oil mill that was completely restored from 2003 to 2006 by the present owners. While the structure and some its characteristic features such as the cupola ceilings, the arches and even a good-luck stone on top of the upstairs master bedroom were kept intact, modern and sophisticated features were added to the house. They include an electronically controlled wire system; 24/7 DSL Internet access, a stereo system that piped into all rooms, including the bathrooms; and an extremely quiet central air conditioning system, with a dual system for heating in the winter. La cupola is an all-season home. The bathrooms and the kitchens have a successful mix of handcrafted features, such as travertine marble sinks and old Neapolitan tile backsplashes, and modern appliances of the highest standard. La cupola is built on two levels and has two completely independent apartments, with their own bathrooms, kitchens and outdoor terraces. (All bedrooms have their own bathrooms.) On yet a third level there is a magnificent infinity pool that makes you feel as if you could swim into the sea in front of you. A fourth terrace has a wonderful shaded limonaia, or lemon tree pergola, where you can sit and have a drink or rest on a lounge chair in peace and seclusion. From the entrance on the street level you enter into a terrace above the property. 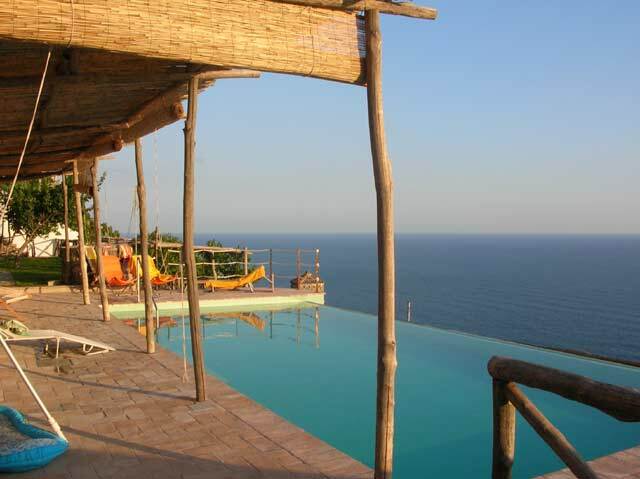 You go down approximately 20 external steps to a large terracotta tile terrace with a breathtaking view of the sea. The terrace is decorated with large terracotta vases with a variety of flowers and plants and furnished with a set of wicker furniture (a two-seat sofa, two chairs and a coffee table) and a number of canvas foldable deck-chairs. It is shaded by a very large natural linen market umbrella and a Spanish-style canvas canopy of the same color. At night the terrace is softly illuminated by in-ground lighting hidden behind the terracotta vases and Moroccan style candles lanterns hanging above a outdoor table (for 8) made with a patchwork of Vietri tiles. 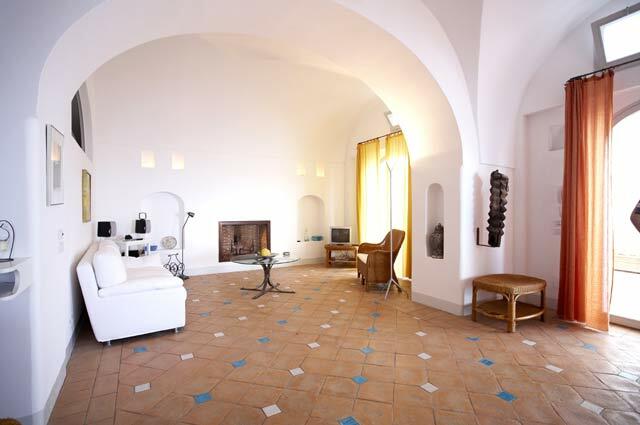 Through two large glass arched doors you enter into the living area, two wide rooms (ca 50 sqm) with cupola ceilings, a picture window that looks out to the sea and a fireplace. It is simply and elegantly furnished with a white sofa, a round glass & metal coffee table and a set of wicker furniture (a two-seat sofa and two chairs). Off the open space outside the living area is the kitchen (ca 20 sqm). With a large single glass panel door facing the sea, the eat-in-kitchen has a wooden table that sits 6-8, an extra-spacious travertine sink, a backsplash of antique Neapolitan tiles, wooden and tile countertops, an American-size stainless steel refrigerator, a semiprofessional stove, an electric oven and a quiet dishwasher. The kitchen also has various size espresso machines and a Melita coffee maker. The master bedroom (ca 19 sqm) gets its light and view from a large single glass panel door facing the sea and is furnished with a 19th century cast iron queen-size canopy bed. The wall opposite the bed has built in closets and a desk equipped with a computer with 24x7 access to the Internet, a printer and a fax machine. The bathroom (ca 5 sqm) has walls painted in the Venetian spatula style and a handmade Vietri tile floor. It has a shower, bidet and sink set on a travertine countertop. The second bedroom is a small (ca 13 sqm), but lovely, internal bedroom with two twin size beds that can be joined to form a king sized bed. The wall opposite the bed has built-in closets with drawers. To compensate for its size, the bedroom opens into a spacious second bathroom (ca 10 sqm) hand painted ochre Venetian spatula walls and a Vietri tiled floor. 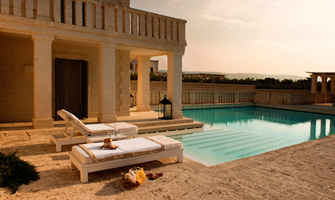 There is a shower, bathtub, bidet and sink set into a travertine countertop. Approximately 20 external steps down will lead you to the downstairs terrace. Under a bougainvillea pergola shaded by canvas and cotton curtains, a large handmade outdoor table of Vietri tiles allows you to eat or drink in front of the exquisite view of Positano and the Mediterranean Sea. In front of the terrace is a beautiful grass lawn kept green all year round by a sprinkler system. To the right is a huge, hand-made terracotta vase, which sits next to an old pomegranate tree. The master bedroom (ca 15 sqm)of the smaller apartment looks out at the sea through an all glass arched wall. There is a queen size bed and a built-in closet with drawers. The bathroom (ca 6 sqm), which adjoins the room, is hand painted hand-made Venetian spatula technique and has a Vietri tiled floor. There is a bathtub, shower, bidet and sink set into a travertine countertop. Next to the master bedroom (with its own access to the terrace and a magical view of the sea through a glass wall), the living room (ca 40 sqm) is furnished with two white sofas. A large wood dining table separates the living area from the kitchen area, which has a travertine marble sink, dishwasher, retro-style refrigerator and a handmade Vietri tile backsplash. Hidden on the side and below the lawn is a vegetable garden on which the gardener grows tomatoes, potatoes (for which Praiano is famous), eggplant, herbs and delicious wild arugula. When in season all of this produce will be available to you. Going down another 20 steps and to the right is the fruit-lined (lemon, plum and apricot) path to the pool area. At the pool, sitting under the pergola, looking out at the sea, with Capri on the horizon and Positano to the right, you will feel like you are in your own private paradise. Three elegant steel lounge chaises and six foldable deck chairs allow you to stay under the sun or rest in the shade while enjoying the sensational view. 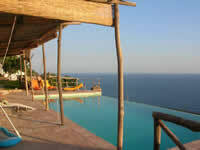 In the pool, the infinity side toward the sea gives the startling feeling of being able to swim straight into the sea. A few steps past an outdoor shower, hidden behind stones and a bougainvillea-covered iron cupola, is the fourth terrace. 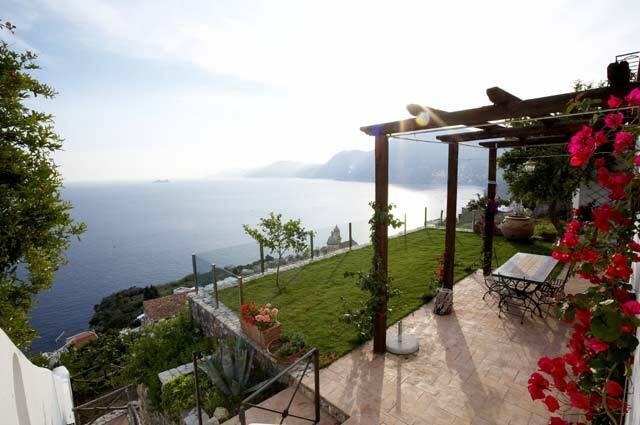 This too faces the sea, Capri and Positano and is shaded by lemon trees. Under the pergola of lemon trees is a hand-made round ceramic table and four iron chairs. It’s a perfect spot for drinks at sunset. Distances: A little supermarket , at about 600 meters from the villa ,is well stocked and provides nearly everything one would need. 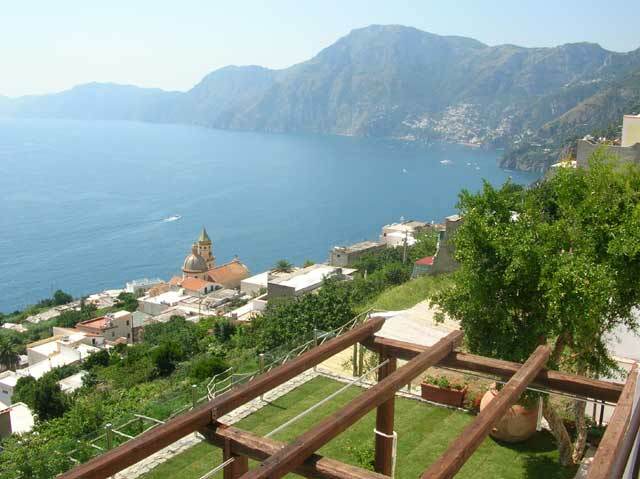 Coffee bar with an Internet Point, restaurants, post office, the stop for the SITA bus that connect all the villages along the Amalfi coast etc are at approximately 1,500 meters from the house. The local mini-shuttle which runs from Praiano to the beach at La Praia and Positano , stops at about 400 meters from the villa. 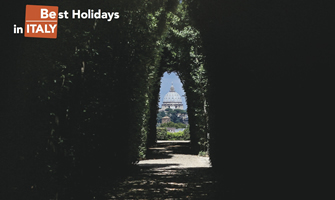 Positano is approximately 10 km (6 ml), Amalfi 13 km (8 ml), Pompeii about 60 (36 ml) km, Naples about approximately 80 km (48ml), Rome (Fiumicino airport) is about 300 km (180 ml)..
Access: About 80 yards from the road, a pedestrian only walkway takes you to Il Mulino. 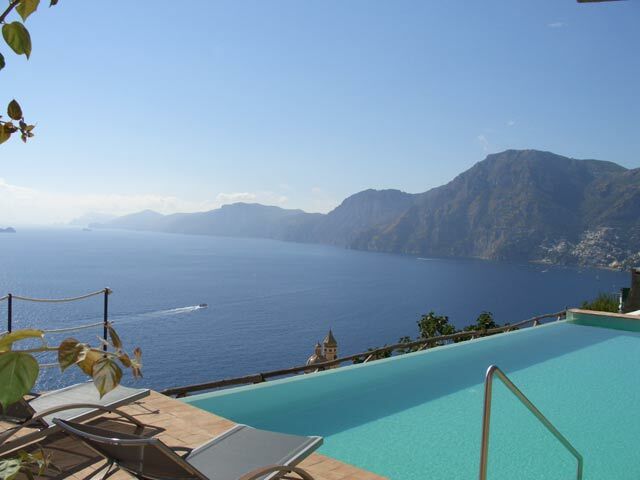 Positano is approximately 10 km (6 ml), Amalfi 13 km (8 ml), Pompeii about 60 (36 ml) km. 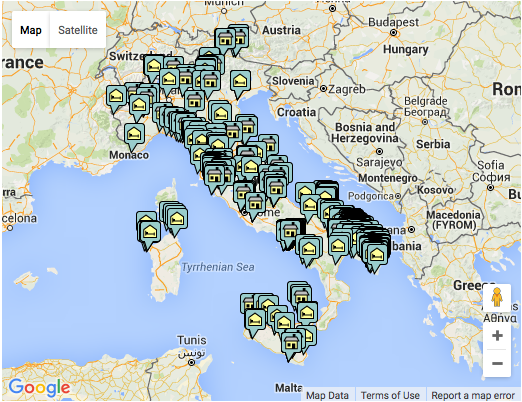 Naples about approximately 80 km (48ml), Rome (Fiumicino airport) is about 300 km (180 ml).